Particularly for beginners, the cable cast on is my weapon of choice. It’s simple to learn and applicable to both stating a piece of knitting and adding stitches in the middle of your work. The easy two needle mittens pattern uses both of these techniques. The cable cast on displays a nice tight edge which looks like a rope. Both the front and the back side of the cast on look good. If you are a beginning knitter who uses the knitted cast on, you will notice that the cable one eliminates the loops that you create in the knitted cast on – look much nicer. To see the cable cast on edge have a look at the title page of the video below. There are two distinct opinions on this cast on. Some describe it as firm and flexible. Others describe it in less salubrious terms as not flexible and with a tendency to break (June Hemmon Hiatt, Principles of Knitting, 2nd ed., p. 68). I use this cast on extensive and side on the positive side. I’ve never had it break and I’ve never had it wear out on any edge that took a lot of wear. Occasionally you need to add stitches in the middle of your work. Use a cast on to add more than one stitch to the left or right edge of the work, rather than an increase of some sort.. Also use a cast on to add more stitches in the middle of your work, particularly when you are adding more than one stitch at the same time in the same place. Examples: a knitted buttonhole or the stitches at the base of the thumb in our mitten pattern. 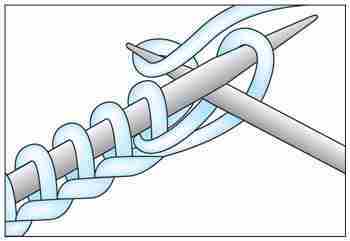 A cable cast on is perfect for this because the casting on can be done continuously from where your are knitting – no breaking yarn to do it. If you are adding stitches in the middle of your work make sure you keep count of your stitches. It’s a little tricky to figure out where the work ended and the new cast on stitches start. It’s possible to purl this cast on as well. In this last video a knit 1, purl 1 rib is created, alternating knit with purl cable cast on. This isn’t limited to k1p1 rib, or ribbing at all.